I have eight of them and was wondering how many were made. I asked Leaf (new ITG people) and they didn't have that information. It is not on the old ITG website (checklist link gone). They suggested Beckett, but I couldn't find them. I searched all over google, but no luck. Any help would be appreciated for the 2008-09 Checklist of these He-Shoots, He-Scores Decoy/Redemption Point Card with team logos. Last edited by Canadian Kid; 07-19-2016 at 08:29 PM. Pretty sure every CHL team had one.... there's been some movement of franchises since then, but if you look at the 08-09 CHL final standings, all teams listed should be included. 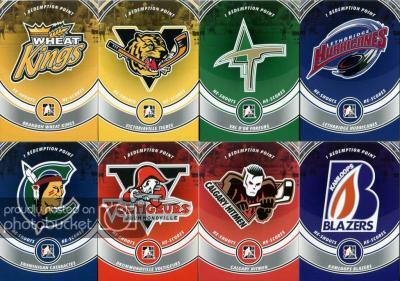 All CHL were included ... just wanted the complete list ... the CHL logo, AHL logo and a few others were included. Last edited by Canadian Kid; 06-11-2017 at 05:25 AM. hey, thanks for the reply!!! "You would need to reach out to Brian Price who owned in the game at that time." same response from former owner ... appreciate everyone's help.